Until recently, like Don C. Warrington, I thought General John Pershing might have been called "Black Jack" because it was his favorite card game. Not at all. On Warrington's site I learned like me, Pershing was originally from Missouri with a strong background in working with African-Americans. When he went into the military this was just his start as the general was noted for his long-time command of the so-called "Buffalo Soldiers", an African-American soldiers regiment begun in the Civil War. When the U.S. entered World War I, his ideas weren't always accepted. President Wilson rejected Pershing's request and put all black units under the French. Since the U.S. had been reluctant to enter the war, Pershing was more successful refusing to be part of the Allied army, instead calling our army the American Expeditionary Force (the AEF). The war was in a stalemate after three years, the French army had mutinied and the Russian revolution had begun. Pershing's ideas did more than separate the U.S. army, he created the first women soldiers by requesting bi-lingual phone operators "Over There" who became known as "Hello Girls." As followers of this site know, I'm working on telling the story of those Hello Girls. This week was the second of my preview programs testing it with some very different audiences. 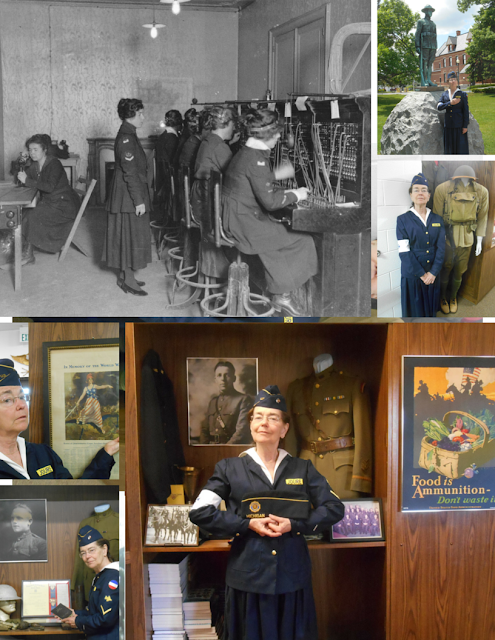 I present the story of the women Pershing called "Switchboard Soldiers" through the eyes of Oleda Joure Christides, one of the few women who finally received veteran's status, a process that took roughly 60 years. It also didn't include most of them because by the late 1970s, out of the 223 serving abroad, only 18 of those serving in France were alive and even then were told they had just become "veterans" and it was not retroactive! The early 20th century saw the battle for Women's Suffrage come to fulfillment almost everywhere. (Saudi Arabia waited until the end of 2015 to allow women to vote in municipal elections.) Here in the U.S. President Wilson initially opposed it, but the war eventually convinced him to support the 19th amendment. I'm rather fond of this August 14, 1917 banner from before the war. I remember vividly a woman in the now defunct storytelling group, the Mount Clemens Raconteurs, tell of her experience at the voting booth when she was among those first women voters. It was not something most men of her day were ready to accept! I don't know if Oleda, who was a teenager needing special permission to go overseas with the other women taking oaths with the Army Signal Corps, ever talked about voting, but she certainly was aware of the decades long struggle to be recognized as more than the "civilian contractor" the Army tried to call her and her fellow soldiers. Soldier is how they were addressed and Pershing was the one who coined the term "Switchboard Soldiers." The more popular name of "Hello Girls" came from the men relieve to hear "Hello" or "Number Please" instead of coping with the French operators. Beyond that, their chief operator, Grace Banker, received a Distinguished Service medal when her mobile unit came under fire, and also women could prove they were threatened with court martial. Both their service and the delay for recognition were definitely a part of the struggle involved in Women's History. I've promised to produce some of my resources here used in preparation for my program. Be sure to go to the other articles here under the label, Hello Girls, also found on my ever-growing sidebar of links. It's the librarian in me that tries to produce as many ways to find information as possible. I presume online readers are good at online searching. I've given many links in those Hello Girls articles, especially pointing people to a site created by Oleda's daughter, Michelle Christides, but also want to send you to some articles she wrote for the children's historical magazine, Cobblestone. If you have access to the Gale Virtual Reference Library database (available here in Michigan through the wonderful Michigan eLibrary) you may access the articles online. Because they were written in 2006, don't be surprised if you own library has "weeded" them out. Future researchers may find libraries with space and money constraints don't have old issues, then if a journal can't be afforded in the future you may not find it easily. Sorry, but I think there's a value in warehousing print, as my own overflowing personal library shows. Because my own work focuses on Marine City telephone operator trainer -- the highest supervisory position open to women at the time -- and musician, Oleda Joure Christides, I am abandoning alphabetical order and starting with C first as her daughter and others in Marine City and beyond have been so helpful and Oleda is my primary focal point. Michelle also has some additional online articles beyond her own site at the Doughboy Center -- a fascinating WWI site, but huge, if you want to prowl it go to http://www.worldwar1.com/dbc/dbc2.htm and prowl each of the 3 icons. For Oleda's story, it's even beyond that as it's within the "2d Army" section under "Biographies & First Hand Accounts" which is labeled "Under redesign but active." It includes diaries, letters, and biographies, including four women, among them Marion G. Crandell of the YMCA, who was the first American woman killed in action. Another article by Michelle is a condensed excerpt at the fascinating site by Captain Barb in her Military Women Veterans which looks at American women and their service starting with the American Revolution. Monahan, Evelyn - A few good women : America's military women from World War I to the wars in Iraq and Afghanistan, Knopf, 2010. Raines, Rebecca Robbins - Getting the message through : a branch history of the U.S. Signal Corps, Center of Military History, United States Army, 1996. Schneider, Dorothy and Carl J. 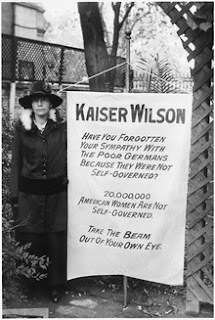 - Into the breach : American women overseas in World War I, Viking, 1991. The story of these fascinating and determined women is finally being discovered.